In a letter to French daily Le Monde, Di Maio accused French governments on both the left and right of pursuing “ultraliberal” policies. ITALY’S DEPUTY PRIME minister has Friday defended his unannounced trip to France to meet anti-government protesters there – a move which has sparked fury in Paris and the biggest diplomatic crisis between the allies since World War II. In a letter to French daily Le Monde, Luigi Di Maio accused French governments on both the left and right of pursuing “ultraliberal” policies that have “increased citizens’ insecurity and sharply reduced their spending power. “This is why I wanted to meet with ‘yellow vest’ representatives… because I don’t believe that Europe’s political future lies with parties on the right or left, or with so-called ‘new’ parties that in reality follow tradition,” he said. The latter reference was a dig at President Emmanuel Macron’s Republic on the Move party, formed by the 41-year-old French leader in 2016. “We have never stopped extending a hand to France,” Di Maio said at a campaign event later Friday in Roccaraso, Italy. Di Maio’s meeting outside Paris with so-called “yellow vest” anti-government protesters – candidates for upcoming European parliamentary elections – was the latest in a string of slights in a row between Italy’s populist leaders and Macron’s centrist government. The surprise trip drew a sharp rebuke from Paris, which yesterday recalled its ambassador to Rome – a move not seen between the two neighbours since the war, when Italy invaded. “He will return to Italy. We’re not suspending diplomatic relations with Italy,” a senior French diplomat told AFP Friday. The escalating war of words began last year after Di Maio’s Five Star Movement and Matteo Salvini’s far-right League won elections and formed a populist and eurosceptic government with them as deputy prime ministers. When Italy prevented charity rescue boats with migrants on board from docking at its ports, Macron blasted the government’s “cynicism and irresponsibility” and compared the rise of far-right nationalism in Europe to leprosy. With the European Parliament vote looming in May, the Italian leaders have mounted a series of increasingly personal attacks on Macron, with Salvini denouncing him as a “terrible president”. They have encouraged the “yellow vest” protests, which emerged in November over fuel taxes before ballooning into a widespread and often violent revolt against Macron and his reformist agenda. France’s Europe affairs minister, Nathalie Loiseau, said the decision to recall France’s envoy was meant to signal that “playtime is over”. 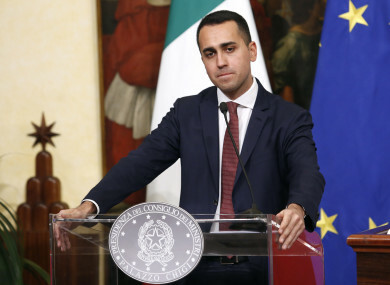 Di Maio did seek to play down the spat in his letter, saying “the political and strategic differences between the French and Italian governments should not impact the history of friendly relations that unites our peoples and our nations”. Salvini, also Italy’s interior minister, said today he had invited his French counterpart Christophe Castaner to Rome for talks. Italian newspapers today described the crisis as the most serious since the declaration of war between the two countries in 1940. “From today, the Alps are higher,” wrote Lucio Caracciolo, director of the Limes geopolitical review, said in La Repubblica newspaper. For La Stampa newspaper, the tensions “could in some ways be expected given how insistent the M5S (Five Star Movement) has been in its approach to the yellow vests”. Email “Italy's deputy prime minister defends meeting with France's yellow vests”. Feedback on “Italy's deputy prime minister defends meeting with France's yellow vests”.